How, Kareem asks, do women writers deal with blacks, migrants, and stateless individuals? What kind of feminist positions are taken within their discussions of racism? Can citizen-women offer an alternative history or new narratives on issues of slavery, migrant labor, and statelessness? Kareem is herself stateless, a poet and writer who has brought out two collections of Arabic poetry, and is currently a PhD candidate in the Comparative Literature Program at Binghamton University. She also blogs at monakareem.blogspot.com. Kareem and ArabLit emailed about the issues that will be raised in her talk tomorrow. Of course, if you’re in the Binghamton area at 1 o’clock on Monday, Nov. 10, please do go. ArabLit: What initially brought you to this topic? Were there ways in which Gulf women writers were writing alternative histories or challenging the ways in which race and belonging are inscribed in the larger nationalist narratives? Mona Kareem: Certainly I have my personal reasons to take on such project, being a stateless woman myself and a woman writer from the Gulf. Yet, I am also hoping to address a gap in western and local scholarships on this literature; what is Gulf literature, how was this category created, what positions it had in relation to nation-formations. 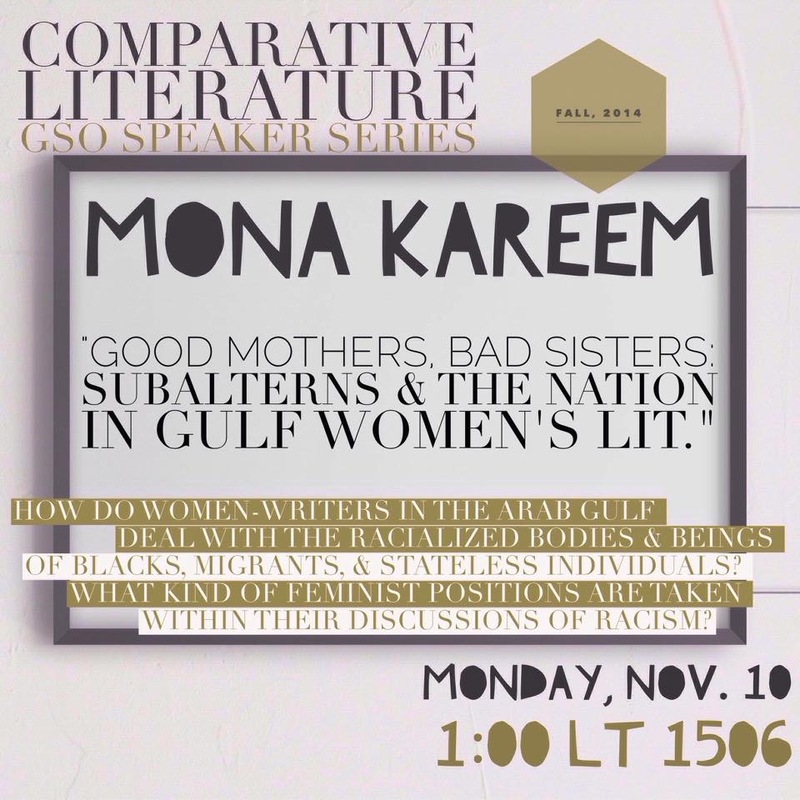 I specifically focus on women’s literature to first challenge problematic approaches that 1) imagine women in the Gulf as only citizens and middle-class and 2) romanticize their writings and struggles, reinforcing the victimization narrative. Feminist scholars (post-colonial or US women of color) have shown us that women have aligned with men of their class/race/religion more than women across these divisions. This critique is crucial and in need of being examined in this context. Yes, Gulf women writers are writing alternative histories, in which they get to centralize their subjectivity and experiences. Some writings are powerful in their positionality; as they show the ways racism and sexism intertwine. This intervention is crucial as it reminds us that every feminism should inherently be anti-racist. Yet, even in such writings, the national processes of racialization, and what I call the “citizen’s gaze” are both present and reproduced on different levels. In many cases, women writers have produced writings on subaltern groups and the nation in the same problematic ways present in their national literatures. AL: What writers are you particularly looking at? Why these writers? MK: Layla Juhani, Badriyya al-Bishr, Fawziyya al-Salim, Taiba al-Ibrahim, Fatma al-Shidy, Sa’adiah Mfarih, and S’ahad al-Fadhli, among others. All of the texts selected discuss the intersections of gender, race, and citizenship to different degrees. They are all contemporary writers who have produced works on society and the nation from varying positions. There are the rising middle-class Saudi women writers, then the upper class nationalist Kuwaiti writers, and also stateless poets. I am aiming to bring a variety of genres and forms to examine this body of literature contextually and inter-textually. AL: Have you interviewed the authors to ask their take on how they address belonging? Do you plan to? MK: I have not interviewed any of the writers. I try to separate the authorial self from the text, not to fall for the trap of the post-colonial writer as a national speaker. Yet, I hope to interview some regarding certain issues, especially when it comes to investigating reactions to their works and the politics of distributing them. AL: Who is reading these books? What sort of effect do you think “mere fiction” by “just women” has on larger social debates and discussions of who matters and who doesn’t? MK: This is what I meant by politics of distribution; the literary economy in which these texts exist. I stand by this position that after all these are fictional accounts. Yet, all national narratives are fictional too. So I hope to see how this literature reproduces and shifts the national narrative. To remember that these are fictional narratives that are read on a very limited scale (numbers of copies, issues of accessibility) is crucial to criticizing the way they are approached as experiments of gender relations in Gulf societies. I also hope to see how these works travelled across languages and how their translations sometimes recycled them for a western audience. AL: Do you think women’s narratives are more or less radical than men’s? Or does it not fall along gender lines? MK: I do not think gender “already” decides the level of each text. However, in the context of Gulf women’s literature, some of these narratives are powerful in tackling certain issues. For example, al-Bishr in “Gharamiyat Shari’ al-A’asha” does not tell us things that were not present in other Saudi novels on gender-relations and family structure, yet she brings a wonderful account on the Saudi state and modernity from a gender perspective; criticizing how modernity has facilitated the monitoring of women’s bodies in public and private domains. Feminist subjectivities are important in creating such accounts, as they historicize certain transitions and shifts through everyday encounters. AL: To what extent when racial oppression is portrayed are racist ideas being re-inscribed and to what extent do you find they’re being challenged? MK: This was an important factor in choosing the works for this project. I honestly have found many writings that have had blatant racist ideas, specifically short stories by Emirati women writers on existing in the “post-oil” city. The xenophobia is straightforward and does not differ much from the everyday racist discourses we grow up hearing in the Gulf (example: migrants are taking over our city. There is a “demographic imbalance”!!). Other writings do not fall in such racist discourses, yet they offer exits in issues of discrimination through discourses of “sameness” and “unity.” I criticize these notions too as they come off like calls for assimilation (at best). AL: Does censorship play a role here? Internal or external? MK: It is scary to get into authorial intentions. I try to bring the issue of censorship when discussing reception of these works. Surely, I see self-censorship present in some works, when for example the author suddenly stops in describing a sexual encounter, or in positioning the state in opposition to women, rather than males. MK: 😀 yes they are offering new narratives. I specifically like the example of Fatma al-Shidi’s novel Haflat al-Moot as it brings a rare narrative on enslaved women in the domestic sphere, and how they are hypersexualized and dehumanized by both “free” men and women. It is really interesting that Omani women writers were the first to speak on such subjects, although other attempts were not this critical (and sometimes racist). These narratives bring the gender perspective into national literatures, yet this perspective does not always take into consideration how gender takes different positions when met with axes of race and citizenship.